The days are growing shorter, boots of various colors and sizes are again becoming fashionable (and necessary) while the supermarkets are busy stacking brightly packaged tins of peppermint cocoa and gingerbread houses – yes, summer’s officially over and so is autumn. There’s nothing I enjoy more than the four seasons of New England. But as I get ready to welcome winter, I look back on the seasons gone by. Here’s a couple of photos from our summer hike to West Rattlesnake Mountain in Holderness, New Hampshire. In the first picture, you see a storm-cloud forming in the distance. Not long after, it started pouring and we had to run back to the trailhead as fast as we could. The second picture is from a look-out point on the same mountain. The heavenly combination of blue skies and bluer lakes, tall trees and bare mountain tops is a common sight in northeast America where every hike is rewarded by a stunning view and not just from the top! James West’s “Point of View” is a larger than life bronze sculpture depicting George Washington negotiating with the Seneca leader Guyasuta atop Mount Washington in Pittsburgh. Since today is Thanksgiving Day I thought of posting something in keeping with the origin of this holiday. On second thoughts, I could have doodled a turkey and blogged about baked brussel sprouts but the Barefoot Contessa beat me to it. Every now and then I want to write about an offbeat destination in Connecticut, which doesn’t get the attention it deserves when it comes to tourism. 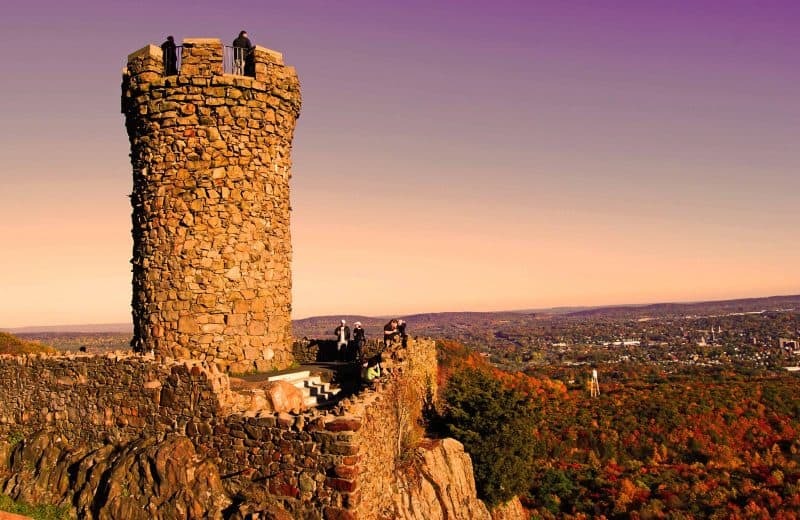 If you want expansive views of New England and a touch of Scotland, you should consider paying a visit to Connecticut’s Silver City, Meriden. The city was the hub of manufacturing in the 1800’s and among other things, silver was one of the key products, which explains the nickname. The castle is the ultimate lookout point, especially in autumn. For miles beyond, all you can see is the scattering of red, gold and orange against the clear blue sky. Apart from a road which is open from May through October from 10 A.M. to 5:00 P.M., there are quite a few hiking trails in the park, one of which lead up to the castle. Entry is free and pets are welcome. 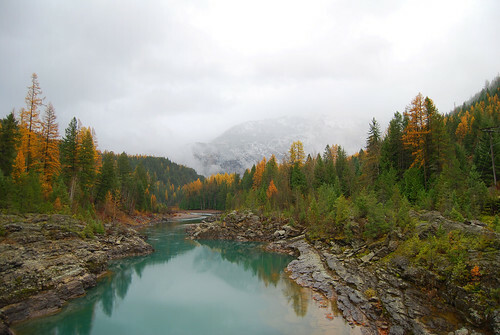 With or without the vibrant colors of fall foliage, the place is well worth a visit. For more details visit City of Meriden and for the trail map click here. If you ask me, the best thing about traveling by train is that you can wear your shoes and keep them on for the entire journey. Nope, not the free Wi-Fi or the scenery or even the dining and wining. For me, it’s all about the shoes. I can ignore the delays and the added travel time. At least I don’t have to take off my shoes and put them in a bin. I don’t care if I am standing behind somebody like George Clooney from ‘Up in the Air’. No matter how efficiently you do it, there is no graceful way of taking off your shoes and walking around in your socks in public. But my favorite mode of travel remains the never-out-of-style road trip. You stop when you want, there’s no limit to the number of things you can carry, you can pack five different types of sunscreen and all your boots. Just dump them in the trunk and you are good to go! It helps that I love driving and USA has an amazing network of well-maintained interstate highways, one of the best in the world. It’s not always about traveling from point A to point B (unless it’s for business or something urgent); when it comes to vacation travel, what also matters is how you get there. A couple of years back, for some reason not exactly clear to either of us, my husband and I had taken a trip down to Rhode Island’s Narragansett in the middle of November. It was windy and well, cold. This is a picture of the Narragansett Towers on Ocean Road, once called the gateway to the world. 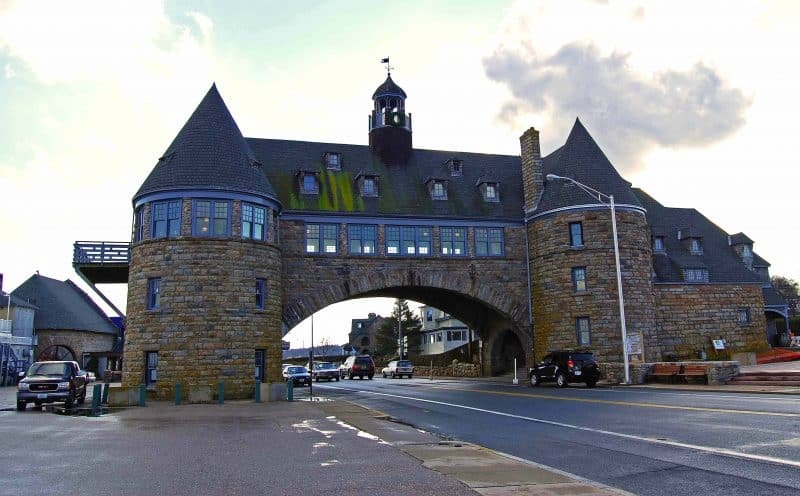 Designed by the New York firm of McKim, Mead and White, it is the last remaining portion of the Narragansett Casino. Back in the 19th Century, it was hailed as one of America’s most prestigious resorts. After surviving decades of fire and hurricanes, The Towers still hold their own with pride and grandeur reminiscent of a past era. But the Narragansett Towers have got me thinking of casinos. So here I am, googling Connecticut’s Mohegan Sun which is supposedly the second largest casino in the United States. Their website has an option for viewing the pages in “chinese” – whoa! First of all, there is no language called chinese, it should be mandarin or any one of the numerous languages spoken in China. And second of all, why in Chinese? Hmm…I think I have to go there and find out for myself! Last week started on an adventurous note. I hopped on a plane to Minneapolis and from there to Kalispell Airport in Flathead County, Montana. Tia Troy, Public Relations Manager of Glacier Country Tourism greeted me and my fellow journos as we picked up our assorted luggage and embraced the cold Montana air. 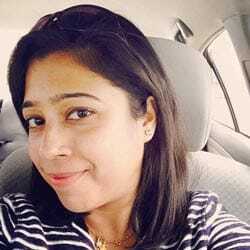 Tia doesn’t believe in wasting precious time, especially when the itinerary includes horseback riding. Well, as they say, no trip to the west is complete without a ranch visit. For the next seven days, we touched upon the cities of Whitefish, Essex, Havre, Chinook, Malta, Glasgow, Fort Peck and Great Falls. Traveling from western to eastern Montana, I could feel the change in landscape and a variation in the cultural fabric. In a state as massive as Montana, where it takes from sunrise to sundown to go from one end to another, the differences are expected and welcome. Refreshing even. For seven nights, I stayed in seven different hotels but the ones that stood out are the Good Medicine Lodge in Whitefish (excellent decor, food, hospitality and amenities) and of course, the Izaak Walton Inn (there’s something very charming about it). Gayle Fisher, Executive Director of Russell Country Tourism and Carla Hunsley, Executive Director of Missouri River Country Tourism took over from Tia as we toured their respective regions. Cheryl-Anne Millsap from the The Spokesman-Review and Tonya & Ian from World Footprints made up the rest of our tour group. Great company, good food and plenty of travel. Ideas were tossed around and opinions were formed, pictures were clicked, memories were made and best of all, friendships were forged. The state of Montana is home to the widely popular Glacier National Park. Scores of activities and plenty of wildlife are the main draws. Second day of my week long Montana trip was spent hiking the gorgeous Glacier National Park. Intermittent showers did not deter us from exploring the park which as you can see from the pic above is every bit worth the extra effort. Tiny Tidbit: A particular type of algae is responsible for the green color of the water. During dinner at the Izaak Walton Inn in Essex last night, we found the menu dotted with tiny purple-green images of huckleberries, a kind of wild mountain berry native to the Pacific Northwest. Apart from being a favorite among the area’s bear population, these fleshy berries find their way into menus all over the region. Each of us ordered something or the other with the berry in it. The beer was from Great Northern Brewing Co. in Whitefish, a pale brew with just the slightest hint of huckleberry. 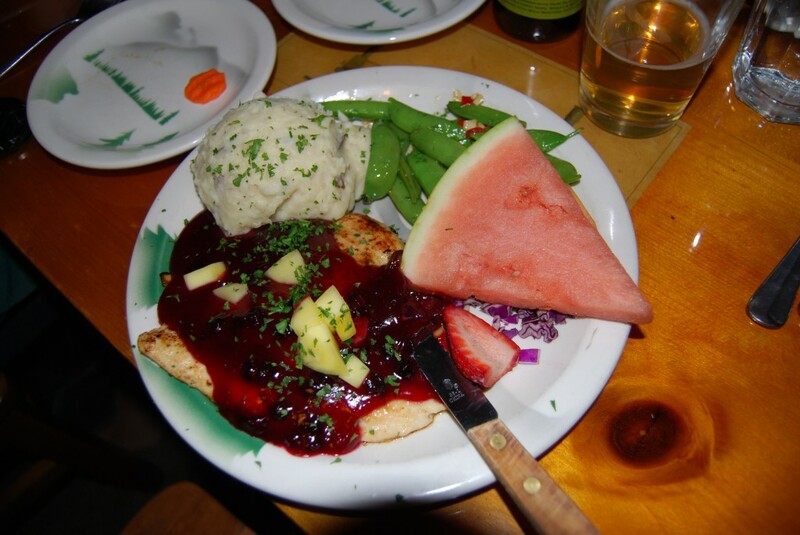 The six ounce boneless grilled chicken was deliciously tender with a generous drizzle of huckleberry orange sauce. And well, even dessert had the purple tinge of the local berry. You just cannot avoid this berry in Montana, and when not in food, it is found in lotions, candles and soaps! Big Sky Country, as Montana is often known as is home to cowboys (and cowgirls), fly fishermen, bears, mountain lions and very friendly people. I have been here for just two days and already I am beginning to understand why people from all over the country are always moving to Montana or planning a vacation here. My first taste of the wild wild west began with me riding a cute li’l pony called Cash in the Bar W Guest Ranch. We were assigned horses based on our riding experience, height and weight. That was yesterday. Today we hiked the Glacier National Park, which borders the Canadian provinces of Alberta and British Columbia. Pics coming up. I arrived in Kalispell, Montana yesterday all set to spend an entire week exploring America’s fourth largest state. Tia Troy (Public Relations Manager at Glacier Country Tourism) and Ian & Tonya Fitzpatrick from World Footprints – all three of us drove straight from the airport to Bar W Guest Ranch, located on Spencer Lake in Whitefish. 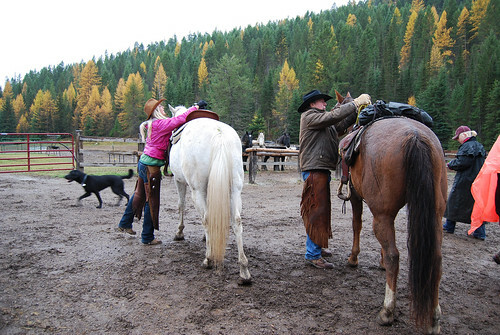 With over 3,000 acres dedicated to horseback riding, this ranch was the perfect way to kickstart my western adventure!